Robert Marzano has created lists of 30 Core Content words that are needed by students for each subject at each grade level to be successful. To help my students understand these important words I have created small posters with the word, definition, a sentence, and an illustration. 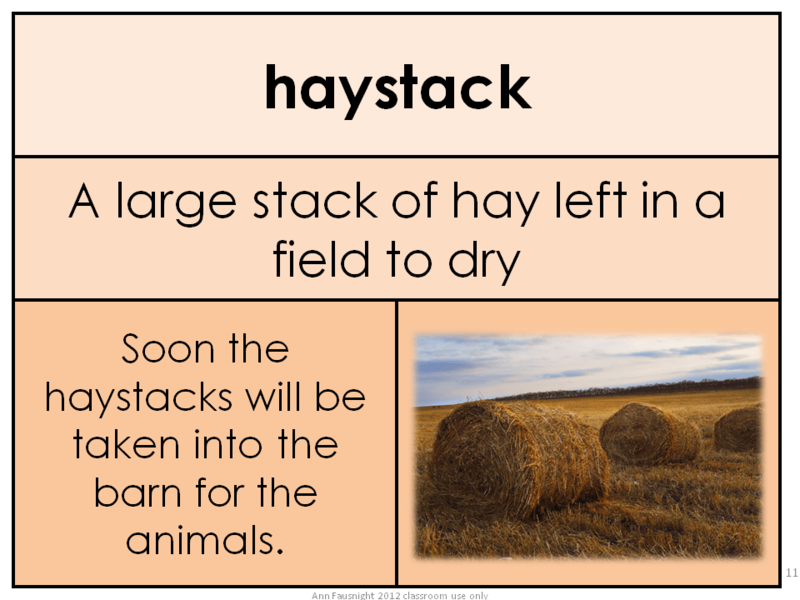 Sometimes the cards vary and contain synonyms, examples, or other helpful strategies to provide students access to the meaning. The first word for third grade social studies is adapt. What an important concept! Being able to adapt is a major component of a successful life. With some discussion and examples, students are usually easily able to grasp this concept. It is helpful to students to point out throughout the year when adaptations have been made. One of my students wrote this statement yesterday. It was written in response to an assignment to write a sentence using adjectives. This is the skill we focused on with our Mentor Sentences this week. Kaylee synthesized what we had been talking about with adjectives and our week long references to Dr. King into a very spectacular thought. Since Monday is both MLK day and Inauguration Day, speeches are indeed an appropriate topic for the day. Here vocabulary is chosen carefully, strongly, and for impact. Consider Lincoln’s Gettysburg address, Churchill’s “We will fight them on the beaches”, Kennedy’s “Ask not what your country can do for you” and “We choose to go to the moon” speeches as speeches that brought dramatic change to our world. 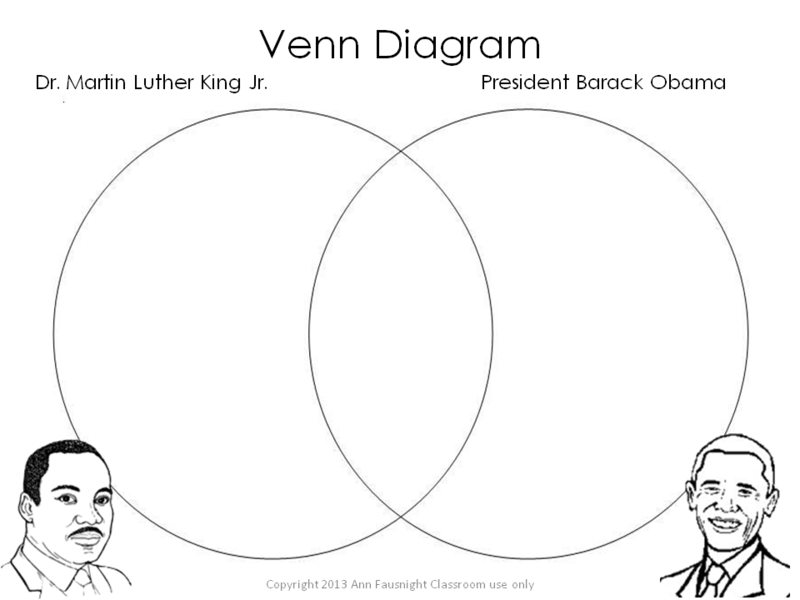 Dr. King’s “I have a dream” speech has become a part of our country’s vocabulary. Maybe Monday will bring a memorable speech. We can hope that words can be spoken to improve our country and our world. Mr. Obama brings hope for many in a way similar to Dr. King. It would be of amazing benefit if he could find words of healing and of progress. Here is an opportunity, at least, to compare these two men who have changed our world. I haven’t shared a Word of the Day card since December. 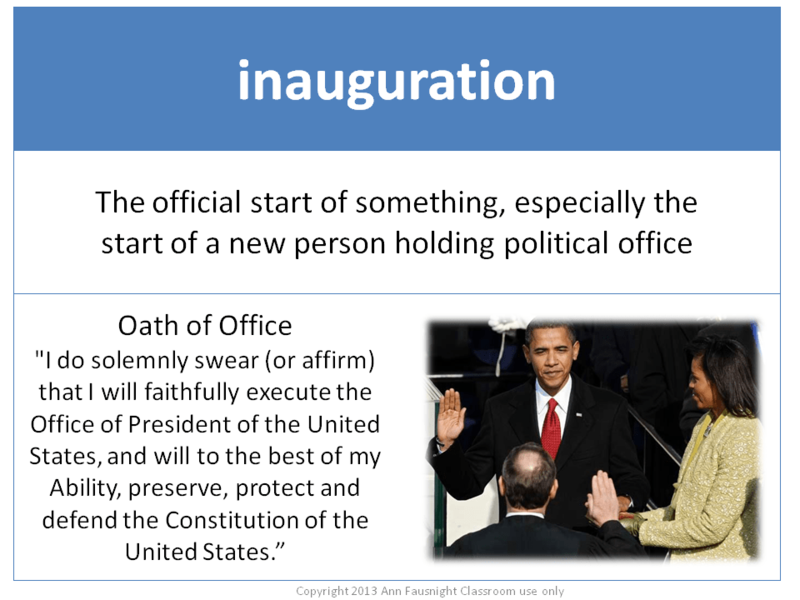 Here is a new one for inauguration. And here is the Word of the Day card from my National Holidays set for Dr. King’s birthday. 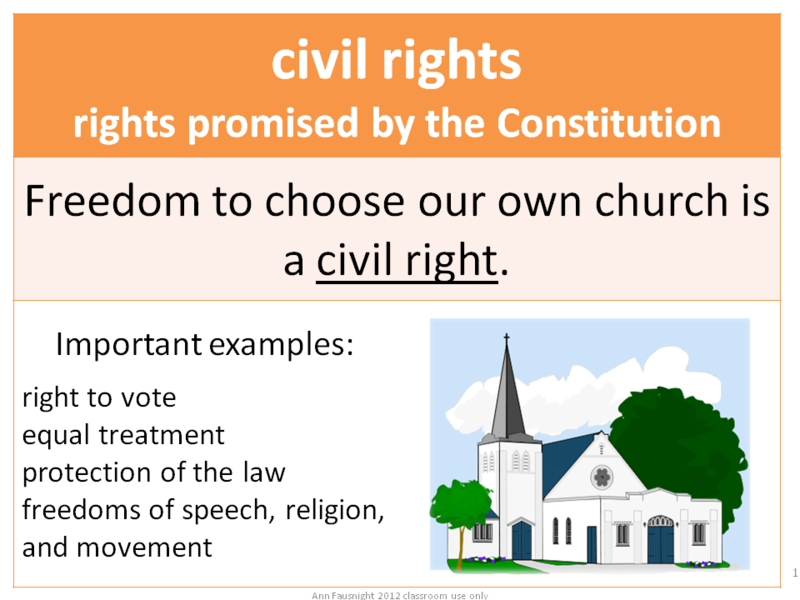 This is a companion card that explains the words “civil rights”. You can see all of the holiday cards and important definitions cards here. I will be listening Monday! 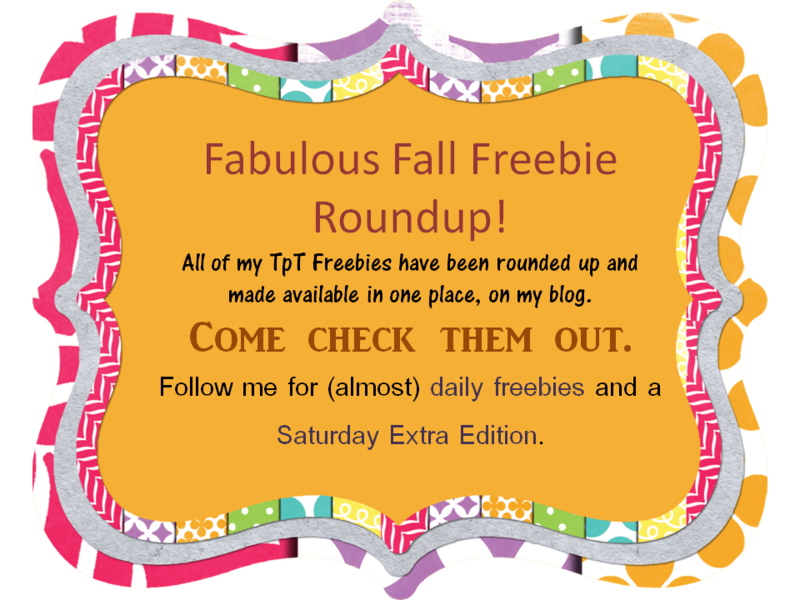 I want to invite all of my readers to find all of my freebies on TpT. I have talked about several of them on this blog, but many others are available. 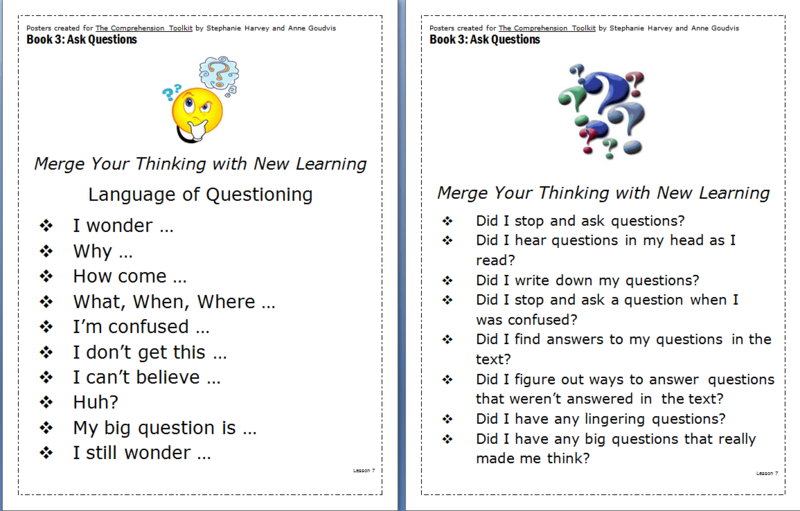 This product creates a 3 and 1/2 chart that shows the levels of Bloom’s questions. I have one in my room. I move the hot air balloon at times to talk about why some questions are better questions than others. Great student discussion requires higher thinking! I also have a product for “Diving Deeper with Bloom”. It has the same format, except that a cute scuba diver goes deeper into thinking about ideas. http://www.teacherspayteachers.com/Product/Dive-Deeper-with-Bloom This product costs $1.00. Our school uses The Comprehension Toolkit to help build comprehension skills and to provide the students with tools for understanding what they are reading. The third – fifth grade set of the Toolkit has 6 books. I have created posters to go along with each book. Since I only synthesized the authors ideas, and didn’t really add any of my own, all of these materials are free. There are 30 posters in all. 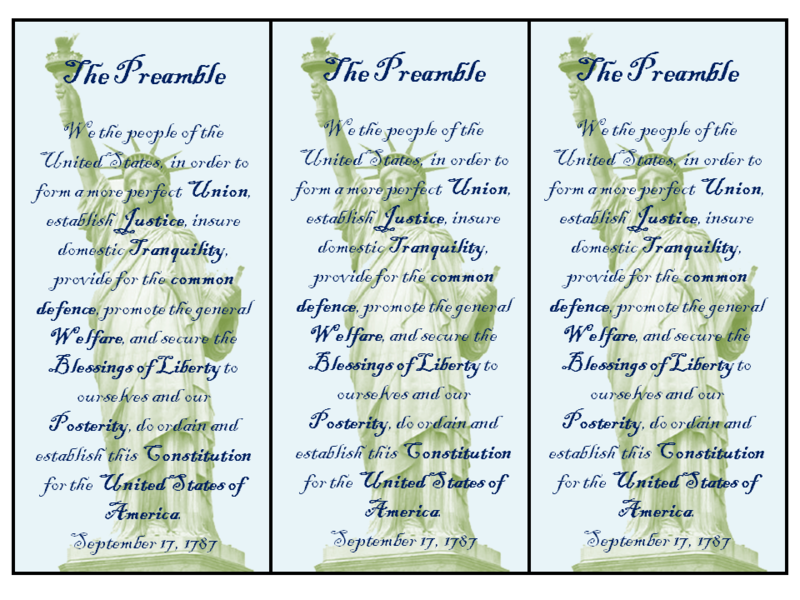 Another freebie, that you have already seen, are my patriotic bookmarks. This set includes bookmarks for the Pledge of Allegience, the Star-Spangled Banner, the Preamble, and the Declaration of Independence. Here is a weather related freebie. This is great for adding a writing component to your unit on weather. My List, Label, Group graphic organizer can be used with any concept. It is a great extension to the “K” part of a KWL. Great for using conversation as a learning tool to build vocabulary. If you have visited my blog before you have seen many of my word of the day cards. This freebie is a package of some of the most popular ones I have posted. Many packages of word of the day cards and other vocabulary cards are available at my store. 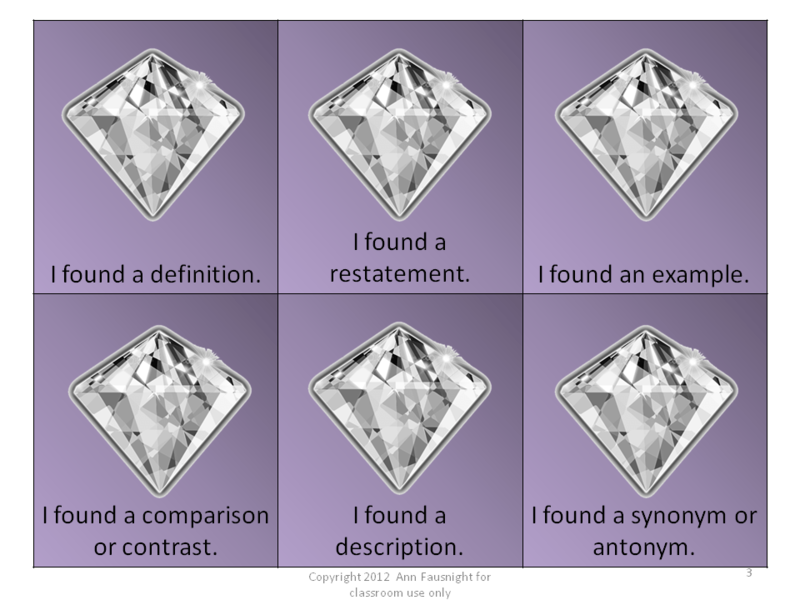 My favorite freebie of all time is my context clues lesson, Diamonds or Coals. I recently added to this freebie to make it even better. Finally, my newest freebie is for Halloween. 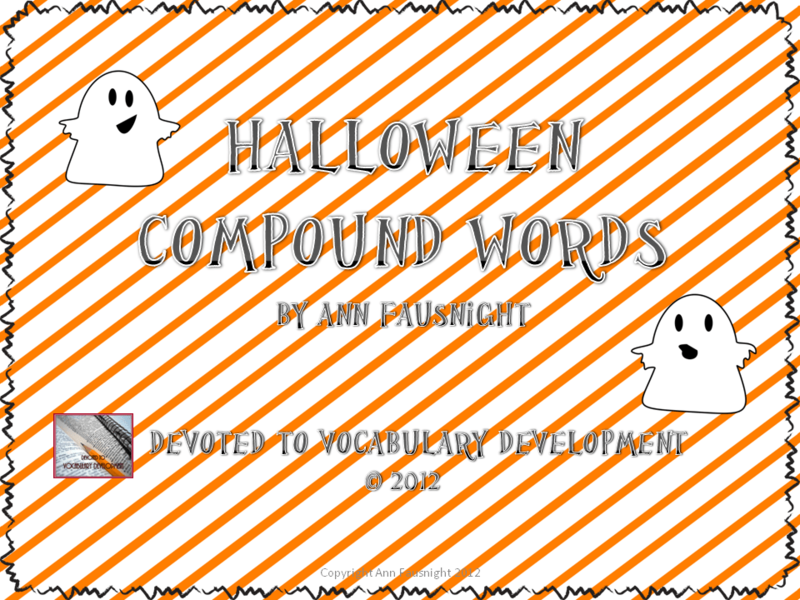 It has two compound word activities. I hope this is helpful and that you were able to easily download any or all of the activities that would be of interest to you. I think next Saturday I will scour my blog for all of the freebies I have only posted here for another roundup! See you Monday with the Word of the Day! 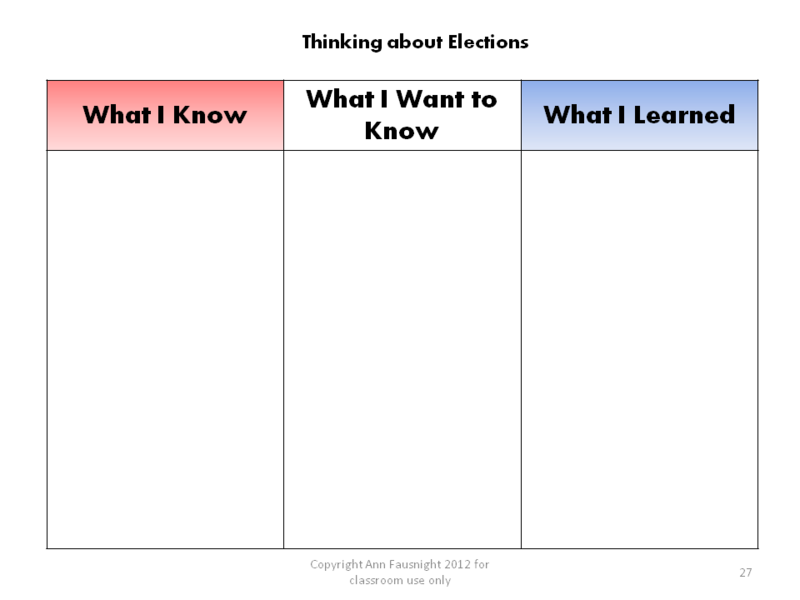 As we are gearing up for elections, I thought I would give you at look at part of my election unit. It is for sale on TPT and TN for $5.00. One way to build vocabulary is through conversation. Have students complete a KWL chart to kick off your lessons, then have them talk as partners, teams, or whole group about each section. Another activity that could be used as a formative assessment after some vocabulary has been presented would be a tree map. You would want students to use the new vocabulary and to be able to add ideas to the right sections. Again conversation will help students retain what they are learning. After vocabulary is introduced and practiced, it is always fun to play games to reinforce and review. I have several games and a gameboard in this unit. 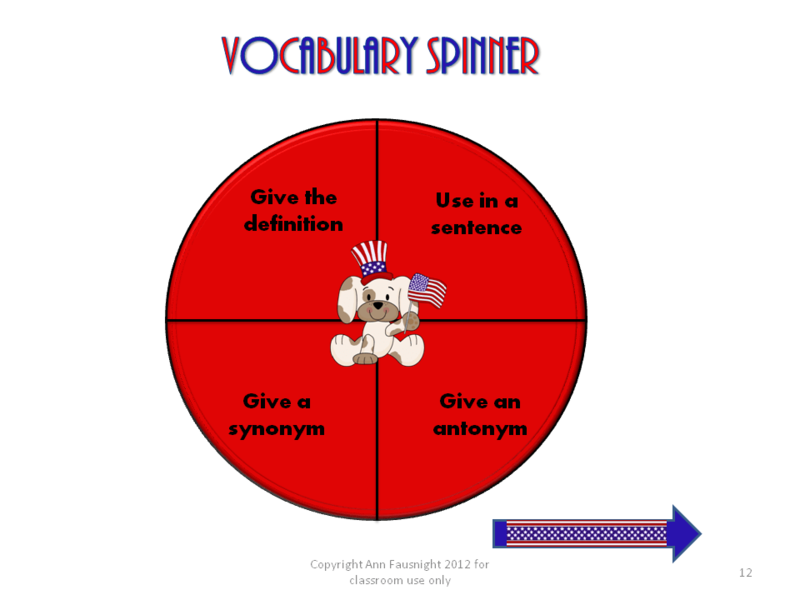 Here is a fun Vocabualry Spinner to help build vocabulary understanding. 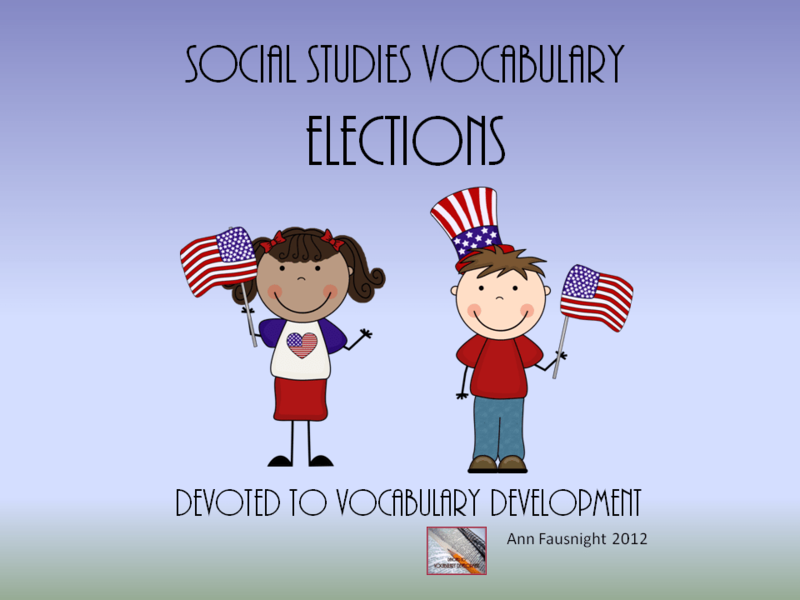 I am excited to begin using my election vocabulary unit in my classroom in the next couple weeks. 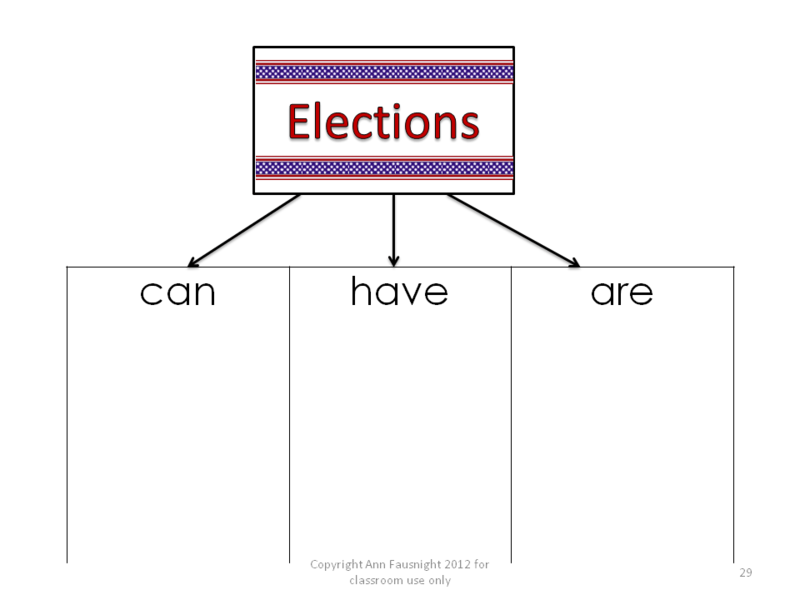 What activities do you have planned for elections?